When trying to Remote Desktop into a Windows machine, I was having trouble connecting via a host name. Using the IP address worked perfectly fine, but no host names could be resolved. After some searching I was able to find a post that pointed me into the correct direction. It would seem that Bonjour reserves the .local section for its traffic on a single subnet. 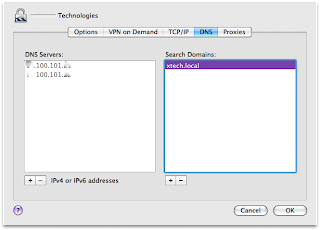 The short is, if your VPN host uses .local for any internal resolving (such as in my case, xtech.local), you'll never be able to resolve DNS names. The fix is to add your .local DNS name to your DNS Search Domains on your VPN connection.